The Cats have come up short against a talented Sandringham outfit, falling to the Zebras by two points. Geelong’s VFL side has come up short against a talented Sandringham outfit, falling to the Zebras, 9.8 (62) to 9.10 (64), on Sunday. 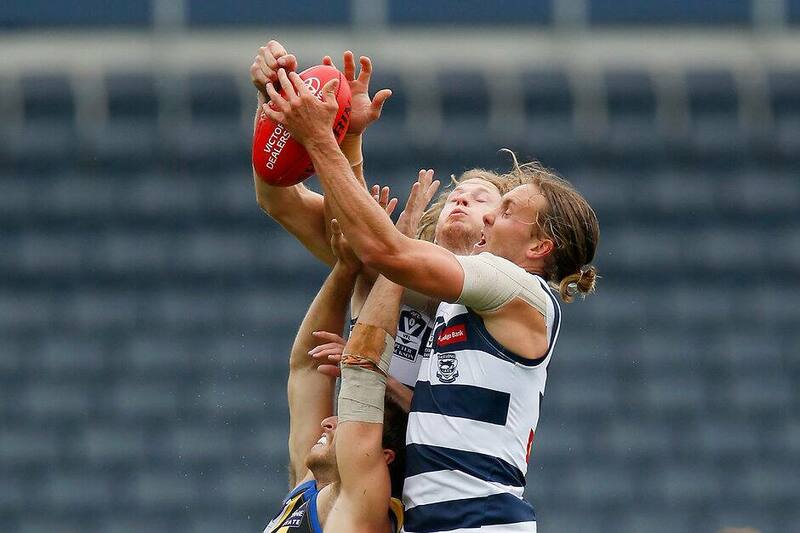 In the curtain raiser to the AFL match between Geelong and St. Kilda, the two sides’ VFL affiliates played out a thrilling contest that was competitive from the first bounce. Wet conditions had a profound impact on both sides’ disposal efficiency in the first term but the Cats were able to get the first three goals to hold a 16-point advantage at quarter time. The game remained a defensive, scrappy affair in the second term with both sides combining for only three goals with the Cats still holding onto a slender lead at the main break. With the improved weather conditions, the game opened up in the second half but remained tight with both sides going goal for goal until late in the match. Sandringham’s Beau Bailey kicked back to back goals late in the final term to give the Zebras the two-point win. The defeat is the Cats’ first of the season and puts them at one win and won loss for the season. An injury early in the match to Aaron Black forced the Cats into changing their forward setup and saw them play with one less player for the remainder of the match. Key defender Timm House was the Cats’ best on the day, finishing with 26 disposals and eight marks. Jackson Thurlow put his hand up for a senior recall with a four-quarter performance across half back. Thurlow finished with 29 disposals, four tackles and nine marks. Draftee Charlie Constable (24 touches, four clearances) continued his strong form as he pushes for an AFL debut. Stewart Crameri played higher up the ground and was amongst the top ball-winners on the day. The former Bulldog and Bomber finished with 21 possessions and a goal in one of his best performances as a Cat. The Cats’ VFL listed contingent were also serviceable for with Jackson McLachlan and Ben Reid finding themselves amongst the best players. The VFL Cats will look to get back on the winners list next week when they take on Footscray at GMHBA Stadium.